Dojo Games-developed fighter coming to PlayStation 4. Arc System Works will release the Dojo Games-developed fighting game Slice, Dice and Rice for PlayStation 4 via the PlayStation Store in Japan on December 19 for 1,800 yen, the publisher announced. Slice, Dice and Rice is an indie fighting game with no health bars. Inspired by Bushido Blade, it revolves around the idea of finding an opening in opponents defense and ending the round with a single, clean hit. Gone are the tedious hit points – each scratch impairs your movement, every wound might be your last. You can play as one of eight characters, all with their own stories and unique fighting styles. Game’s cast offers many variations of gameplay, from a swift monk using only his fists in battle, to a muscular lady with a giant sword that compensates speed and mobility with endurance during her attacks. 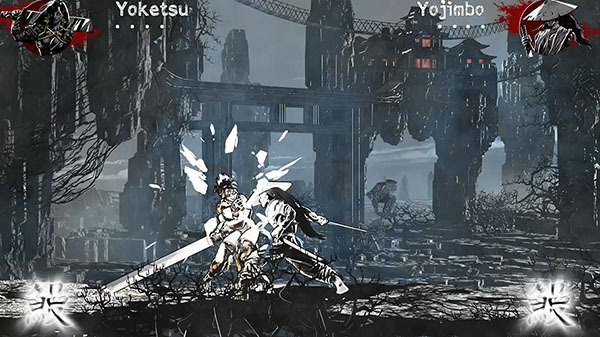 Fights take place in alternative version of Japanese underworld and features 6 unique stages with hand-drawn textures. Watch a trailer for the PlayStation 4 version below.